Since 1986 the former house and shop at 4 Chapel Street in Thornbury has been the home of the Thornbury and District Museum. The museum is a small one and entirely run by volunteers. It has a permanent display about the finding in Thornbury in 2004 of the pot containing the hoard of Roman coins. The other exhibitions largely reflect the life and occupations of the people of Thornbury. The photograph shown here on the left is 4 Chapel Street after it became the home of Thornbury and District Museum but before the new porch extension that was added in recent years. A more recent photograph is shown at the bottom of the page. We have been able to trace the history of number 4 Chapel Street largely due to the fact that for many years it was owned by the Feoffees (or Trustees) of the Grammar School and their records tell us the tenants of the property. The earliest document relating to this property that we have found so far is an indenture dated 16th December 1702. At that time the charity had not been consolidated into one charitable trust. It was still being described as having been set up by Williams Edwards “for the use and benefit of the Free School.” The feoffees at this time were Lord Stafford, William Raymond, John Tayer, Richard Hawksworth, Richard Attwells, John Parnell, John Thurston, William Tanner, William Skey, Thomas Adams and William Marsh. In 1702 the street where what is now the museum stood did not have a name. The property was merely said to be at the top of St Mary Street. Interestingly, there was some evidence that the area that is now Chapel Street was not always in the Borough of Thornbury. The house is said to be “within the Borough of Thornbury… OR within the Tything of Kington”, suggesting that earlier documents must have described it as in Kington. After the death of Anthony Powell the lease was to pass to Nicholas Powell and Katherine Powell his son and daughter, providing they continued to pay the yearly rent of six shillings and eight pence at each of the four feasts Christmas, the Annunciation, St John the Baptist and St Michael the Archangel. This is interesting in that it says that the property was now a malt house. Sadly we know nothing of the property after it had been inherited by Nicholas Powell in 1720 until it appears in the Feoffees records for 1798. Walwin Baylis. The accounts of the Feoffees of the Grammar School show that Walwin Baylis officially took over the tenancy of 4 Chapel Street from 15th December 1831 when he paid rent for a property “lately occupied by Benjamin Baylis” that had been due to be paid on 24th June 1831. It seems likely that Walwin had not only been living there prior to that but was acknowledged as the tenant as work had been done on the property in August the previous year and it was Walwin who was repaid on producing a receipt for that work. Walter Baylis. By 1876 the rate book confirms that this house was owned by the the Feoffees and occupied by Walwin’s son, Walter Baylis. We know from trade directories as early as 1839 that Walter Baylis was a carrier in Thornbury. The trade directory of 1876 (Morris & Co ) shows Walter Baylis as a carrier, haulier and coal merchant in Chapel Street, Thornbury. The rate books show that by 1880 Walter had moved to the property on the corner of Chapel Street and Rock Street, later known as 16 Chapel Street. The 1881 census shows that 2 Chapel Street was empty. William Clark. On 22nd September 1888 the Charity Commissioners advertised the sale of a small messuage or dwelling house in Rotten Row now in the occupation of William Clark. It is possible that an offer was made by the previous tenant, Walter Baylis, because the Governors of the Grammar School met on 21 st November to consider the sale to him. However no sale was made. George Poole. The 1891 census shows that George Poole aged 63 a basket maker and his wife Ann aged 58 lived in this property with their daughter Minnie aged 25 an assistant secondary school teacher and son Isaiah Cullimore aged 19 a printer’s assistant. He appeared in the rate books at this property up and including 1900. George had moved to this property after being the landlord of the Wheatsheaf for several years until he was dismissed for allowing prostitutes to drink in the pub. We have an indenture dated 29th June 1901 in which Francis James Williams purchased this property from the Governors of the Foundation known as the Grammar School. This was the later title description of what had been the called the “Feoffees” in previous documents. Alfred Burrows. The 1907 rate book shows that Laura Williams continued to own this property and the one next door. This house was said to be occupied by “Burrows”. The 1911 census shows that this was Alfred Burrows. Alfred was aged 42 and he was a boot and shoe maker born in Bristol. He had been married for 20 years to Emma Grace Burrows aged 40 and born in Pucklechurch. They had had seven children, five of whom had survived. In their household were a 16 year old daughter Ivy Grace born in Kingswood, Violet May aged 12 who was born in Bristol and Hilda Gladys aged 10 who was born in Street in Somerset. The two youngest children were born in Thornbury. They were Florence Selena Maude Burrows aged four and Alfred Arthur Burrows aged two months. When Ivy Grace Burrows and Violet May Burrows were enrolled in the Council Upper School in 1906 their dates of birth were given as 11th January 1895 and 13th April 1898 respectively. They were said to have transferred from Frome. The 1901 census shows that they lived in Street in Somerset, which is 23 miles from Frome. Their neighbours here were all employed in the shoe making business. The census is unclear but it seems that Alfred was a foreman “rough stuff cutter”. He was aged 32 years old. Their daughter Ivy was aged six Violet was two and Hilda nine months. The records of the Council Upper School show that Ivy and Violet had very different educational prospects. Violet left the school in 1909 with a scholarship to the Grammar School. Ivy left the school in 1908 with what was described as a Dunce’s Certificate. We were initially reluctant to mention this fact as it seemed to imply that Ivy had some kind of learning disability. However it seems that this was not at all the case. The rather unpleasant name was a hangover from the Victorian system which allowed children to leave school when they were ten years old if they had a certificate showing that they had attended school at least 250 times. This was called a Dunce’s certificate as the child was leaving without obtaining an educational certificate. In 1881 the law was changed and children had to attend school until they were 13 but could leave at that age if they attended school for another year on a part time basis. They could only do so provided that they had already reached Standard V in the school. The name Dunce’s certificate seems to have been retained but in fact Ivy had probably done well at school and was most likely leaving early to add to the family income. Children leaving with this certificate must have found its unofficial name particularly cruel. The trade directory for 1916 shows that Alfred was a shoemaker in Chapel Street. In 1925 the Valuation List says that Edmund Cullimore owned this property as well as 2 Chapel Street. The Gazette of 12th December 1925 reported on the death of Alfred Burrows aged 57. The Gazette said “Mr Burrows had carried on business in the shoe trade in Castle Street” but we believe that this was an error in the newspaper and it should have referred to Chapel Street. The funeral was said to be taking place that day. The electoral rolls of 1927 and 1931 show that Emma Grace Burrows continued to live in Chapel Street. The roll of 1935 shows that Alfred Arthur Burrows Emma’s son also lived there. By 1938 Alfred’s wife Lucy Elizabeth Burrows (nee Pitt) also with Alfred and his mother Emma. The register compiled in 1939 in preparation for the war lists Alfred A Burrows and Emma G. Burrows living there. Alfred was described as an ‘Engineer (Viewer)’ born on 10th January 1911. Emma was born on 17th January 1871. Also there was Arthur Henry Jarvis who was a butcher born on 1st October 1869. He had been listed as liing in Chapel Street since the 1935 electoral register. In 1931 he had been lodging with George Harris in St Mary Street. They continued to live there in 1946 to 1950, although by 1950 Arthur Jarvis had moved away. The burial register shows Arthur was buried in Thornbury Cemetery on 19th January 1951 aged 81. He had died in Chipping Sodbury. Emma Grace Burrows died in Thornbury aged 80 in 1951. She was buried in Thornbury Cemetery on 21st December 1951. By 1954 there were no members of the Burrows family living in Thornbury. In 1971 the directory shows three names of people who lived in the property; Susan Hoe, Sheila Richards and Margaret Thorpe. We do not know who these people are. Thornbury and District Heritage Trust. We are grateful for the efforts of Vic Hallett, Yvonne Loe and Paul Wildgoose, members of what was then the Thornbury Society, who set up the Thornbury and District Trust. They and a group of enthusiasts rented two rooms at 4 Chapel Street to store material and do some research in September 1986. Another member Mary Huby acted as accessions officer. She organised the sorting and recording of the large bequest of material from the late Mary Bruton that formed the basis of the collection. The first exhibition in November 1986 lasted only three days, but attracted 400 visitors and much interest. 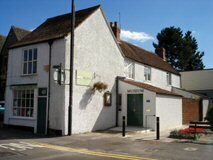 From this the Thornbury and District Museum was born and it was finally granted full Registered Museum status in 2002. Click here to read about Thornbury Museum.